Simple yet cute, these birds will be the talk at your dinner table! Halve the toilet paper rolls. Cut a body for the turkey from brown construction paper. Glue the turkey body to the paper tube. Add the eyes, beak, wattle and feet. 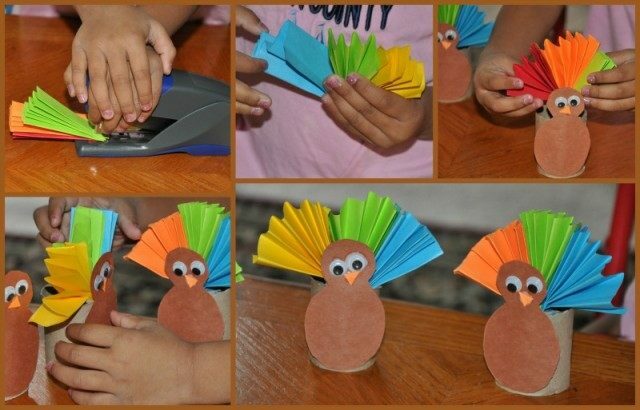 We used colored printing paper so little hands could easily manipulate them and of course for their vibrant colors.. To make the feathers , fold in a zig-zag pattern to make fans or in this case, turkey feathers. Now depending on the length of your toilet rolls you can cut the fans or keep them long. 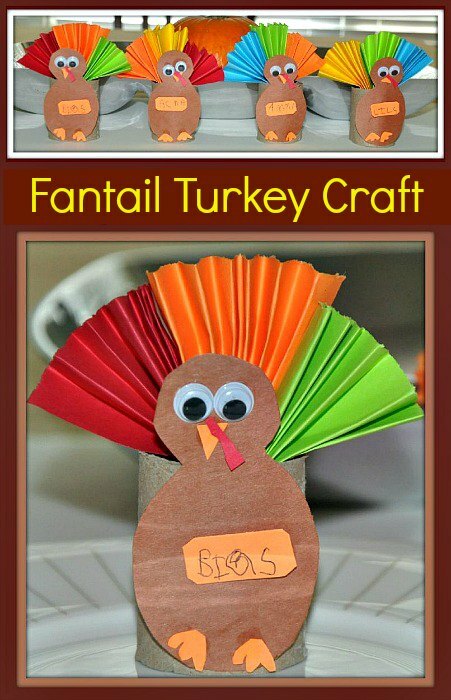 We cut ours because we liked our turkeys to be little cutie- patooties! 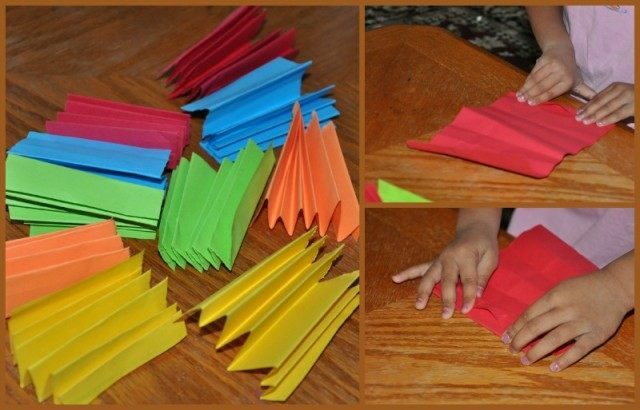 Staple different colored fans and gently separate the folds to open out the fan. Place them on to the paper tubes. 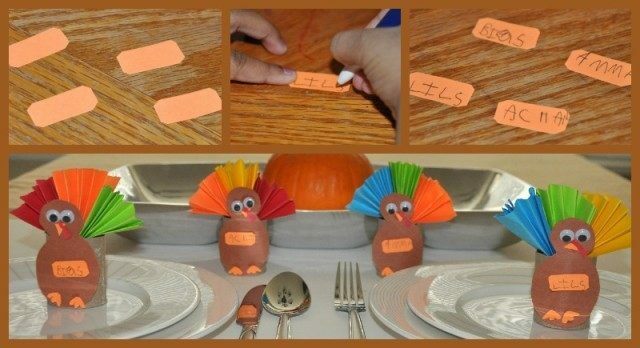 Since we are using our turkeys as placecards, we cut out a small labels with names and attached it to the belly. Big S loves to set the table for dinners and she is looking forward to setting the table for our big Thanksgiving dinner. Which bird gets the raves at the table? – Will it be my 10 pounder Butterball or Big S’s cutie-patootie TP roll bird? You can expand on this idea to make a center piece, or placecards like we did, or even turn them into party favors for your guests. Just close the the bottom of the paper tube and place some treats or thank you notes for your guests to to take home. 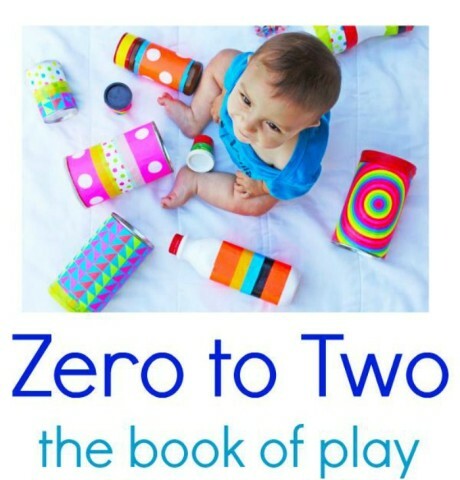 Following are some e-books we have released in collaboration with many other bloggers! 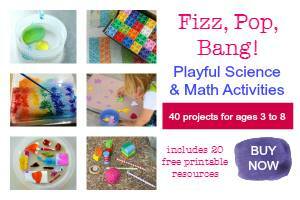 This was so fun to make with my 7 year old. Thanks for sharing. I’ll be doing this craft with my kids this year! I like to have something for them to do while our dinner is being cooked. It helps the day go quicker, they get to contribute, and the table will look more special. Thank u for sharing. Happy Holidays! Thank you ladies ! Have a Happy Thanksgiving . These are too cute! And what a comprehensive guide on how to make them. Perfect for Thanksgiving!